Age of Fable (free retro browser rpg) offers 246 random d6 tables. The tables are not system related and can be used for every fantasy Rpg. The free tables are sorted into categories that cover magic, wilderness, creation of characters and many more. At the library of Age of Fable you'll find further useful resources for fantasy Rpg's like a Creature Generator or a Random Map Generator. The following interview was held between Telarus and Sethariel. Telarus gives an insight into his work of mapmaking and describes the development of the "Atlas of Barsaive". When I first saw the Atlas of Barsaive I was really amazed by the author's accuracy in placing all of the most important locations in the map, including mountains, lakes, forests, not to mention small towns. Mapmaking in high standard. Meanwhile the Atlas of Barsaive by Telarus became quite popular with the fans. Some of them, like me, started wondering how to create a map of your own or at least modify the Atlas to one's needs. I contacted Telarus. We talked. The idea for this interview came as a result. Hi Telarus. I am very pleased that you have found some time to answer my questions about the process of mapmaking. What or who inspired you to create your Barsaive map? The idea came to me in a very abstract way, to begin with. I had the concept for an in-game item, a Threaded Map, that housed an Interactive Atlas of Barsaive. It would top out at a very high thread rank, with lower abilities including simple navigation and distance travelling, higher threads included mapping out the local area after a ritual had been cast. Something a high level Illusionist would craft up in a mad furry to mark the hiding place of the Mask of Oltion, or something like that. Deeds would include riddles and puzzles in the 'software', and traps and geasa (quests with curses/fine-print attached). Something to drive high-level play ("Your sister is the flashing red dot I've placed on your little toy, and I've released six jehuthras..they're the green ones. You're half a mile away, but so are the jehuthras. Good luck.") ....well, you have to assume an item like that is going to get marked, right? Sounds very interesting. I suppose once we had a similar idea. Have you ever created that Threaded Map? I have not laid out the actual stats of the Atlas. I currently do not have an active ED game going, so that was put aside for now. I really like the idea of Magical Maps, and would like to see some ideas from the ED community on those, threaded or otherwise. I also use Earthdawn as a reference a lot in my college studies in Video Game Design, so I may whip up a few Threaded or Legendary Maps as an exercise in applying the ED system. ~ Maps to Kaers that house people related to the PCs. ~ Magical Maps that have a time-limit coded onto them (a changing set of symbols that the PCs can't translate at first). ~ Maps left as clues at crime scenes (these can be normal paper maps, coded maps drawn in blood, or even just random cryptic clues, like colored pebbles left scattered around a wreaked caravan that would only mean something to someone fluid in written Obsidimen. How did this inspiration turn into the idea of an interactive map you created? I had recently suffered some strife a few years before (my house burnt down, with most of my books and gaming materal.. I know what a melted bowl of dice looks like.. ugh). Luckily I had archived a digital copy of most of my favorites, and the original FASA materials were included as I had possesed some damaged copies that I could bare to cut up and scan. The maps in the various Earthdawn box-sets have always impressed me, and I'm very happy to see RedBrick standing up to the high bar set by the FASA art direction. But, this was before any of the buzz and press about ED 'Classic' out of New Zealand. So when I found my files, I realized that I had a good way to present this Interactive Atlas idea to my players. That is why you created the Atlas of Barsaive. What kind of programs did you use? My first few prototypes were Flash files which had maps that you could easily zoom in and out on, and drag the terrain around with the cursor. At that point I didn't have any of the map drawn and had just worked out a simple interface. Then I collected the Barsaive box set map and the Sky Point/Vivane box set map into Adobe Illustrator (I found that the maps were not to scale with each other, or even aligned with each other) and manipulated them together. At that point it was a matter of rendering the terrain with the vector tools. This actually took the longest, as I preserved some of the original art by carving out the mountain valley shading and relief-lighting. I'm talking about a few months of drawing squiggly lines with a digital pen. During this time I was also experimenting with styles for the forests, the lava in Death's Sea, and the rivers, and the snow on the mountains. Once that was done, I referenced all the other maps I could find in the material (Blood Wood, Cara Fahd, Serpent River, many others) and began adding location markers and Names (a few more months of intermittent work). Finally, roads and borders (man, orks like to draw borders - I think that's Theran induced trauma) and some other little details would finish it. When I finally put the map back into Flash, and tried to drag it around, it began to show signs of error. Very slow reponse times at close zoom levels, but it was a working prototype. I believe Sade has an archive copy of that on her website. Did you have any help from the fans? I have recieved much feedback from many fans about the map, and they have caught many omissions and small errors that creeped in during the crafting. I'd like to thank everyone for helping to improve this resource. It spent about 2-3 years at a corrupt .fla flash file and an incomplete version of the illustrator file. During this time, RedBrick has given the Earthdawn community much needed dose of energy and new ideas. When I saw the need for a good map resource for the community, I knew that I would have a better release with some more work. I pulled all the vector info out of the corrupt .fla file, and re-worked all of the styling and labels and crafted the PDF version of the Interactive Atlas of Barsaive. This took a few weeks, and it has undergone various updates as the community has helped me maintain it. What was the most difficult part of the work? Hand tracing rivers and crags only for so long each day so I could spend time with my girl. I would say that the few weeks of re-drawing areas near the first release of the PDF. It was soooo close to being ready that the last few weeks were fun to do and flew by. Do you have any advice for someone making his own fan map? 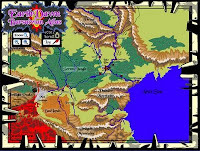 There are a wealth of gaming mapper resources out on the net. I would recommend learning a robust graphics program (Gimp is a good Open Source alternative. Inkscape is another good Open Source vector illustration tool), and start learning about maps. Once you have an overview on how maps are presented, and the different styles they come in, investigate some of the digital mapping tools available. You really don't need anything too pricy, and there are tons of tutorials found by googling for "fantasy maps tutorial" or similar search terms. These will be the "Threads" that you weave your map out of. Next, you have to have the right Pattern. - Only to be seen by the GM, and updated..then used to generate a 'player' version with certain thing hidden? That will require certain techniques and file organization. Save a copy of the file, add in the "fog of war". There are some tools that can even calculate light sources for you. - Hastily-scrawled looking map that show a small area of the docks. That requires others, and investigating textures like parchment and charcoal. - A battle map would require reasonable tactical areas, thinking about line of sight issues, and attention to scale and where the action should be focused. - Formal Kaer blueprint with encoded trap markers all over it. - Many other intents and possibilities. Then start doodling, draw and rough out a basic version. Save this. Next, start a new file and use your tools and techniques to make a better one. You'll probably go through a few of these cycles before you have something you like and which fulfills the purpose you set out for. Learning is an iterative proccess. Any future plans concerning your map? 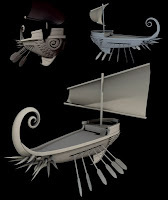 Right now I am learning 3d computer graphics and effects at school. I plan on using my PDF Atlas as the basis for a few different project ideas. From 3d rendered flying pans down the Badlands terrain, to images used in a Wiki-style atlas. I want to stick as close as possible to real world digital elevation model (DEMs) data as a base, and use my PDF atlas to tell me where to carve or lift terrain for rivers, volcanoes or other 'Barsaivian' features. I also plan outlandish things in my mind, like modeling a large chunk of Bartertown including the Gates of Throal, and using the 3d version of my map to render the background and horizon-level terrain. Yes, you'll definitely see more material from me at some point. Thank you Telarus, for the interview and sharing your knowledge with us. Thanks for the interview too, Sethariel! It's good to see the community taking a hand in crafting the future of Earthdawn. Anduin is a free german fanzine for roleplaying and tabletop fans. It's freely available as PDF and has published until now 95 issues. As you might know I am always looking for Earthdawn stuff in such magazines. I put together the issues, that contain Earthdawn related articles. In Issue 66 you can find two articles, one concerning the cooking in Barsaive offering some T'skrang recipes for example. The other is a well done kaer adventure called "divided heir" (22 pages) at page 8. Issue 67 offers some magical artifacts made by Kathy Schad at page 34. At the end of this article is a link to Wyvernlair Kathy's former very well done Earthdawn page. But unfortunately it wasn't update since 2004 any more. Back to Anduin Issue 86 bringing to you a remarkable adventure called "Mahatsch on the brink". Page 59. Anduin Issue 87 contains on page 96 the adventure "Elemental rage". This adventure starts in Throal and can be played by 4-8 characters of the 5-8th circle. In Issue 91 an adventure-tale about the "whispering tower" is told on page 67.